In a turn ski put on edge and bend. The most effective turn is when ski put on snow with all length of edge and drive like on rails. For this it is necessary that deflection of ski was in accordance with shape of sidecut. Or vice versa. Anyway, it is desirable to match shapes of sidecut and sag. To be honest, until recently, I believed that such problems do not exist now, manufacturers long time ago optimized the characteristics of the ski. It is only necessary to be able to use them. As wellknown skis have sidecuts in shape of “hourglass”. When lean the ski clings to slope with the widest parts on the toe and tail and under the forces of the skier and Nature starts to sag until entire length of edge put on slope and then go in an arc like on rails. If you need to turn more strong it is necessary to angle ski more. That is, I believed, a shape of sidecut is a sequence of great experience of ski manufacturers, and the characteristics of bending of ski should easily allow the ski evenly lie on the edge. Unfortunately, the field tests on cold ( -10 C) ice described in note forced to doubt about primary role of sidecut shape. I had to think about not less importance of characteristics of the ski deflection. May be the deflection is not simply “serves” sidecut but significantly affects the “railed” curve. Indeed, let’s consider ones more above process, especially on ice. After lean of ski edges on toe and heel clings to slope and ski start to bend, but in accordance with its natural deflection. Then it all depends on what part of edge touches the ice first. Ideally, the ski should lie down on the ice once at all length of edge (so shape of sidecut should strictly conform to the natural sag). And this should happen quickly. On the ice an unstable state when the ski supports only to the toe and the heel is very limited in time. If ski do not lay to slope fast it begin to slide. And if edge begin to slide on ice it hard to stop it. So such abstract considerations about the best edge grip on ice lead to assumption that shapes of sudecut and sag should be in good accordance. It could be tested in some particular case. I have a measured shape of ski deflection (Atomic FIS SL). This is shape of free deflection similar to described above in the hypothetical turn on ice. Ski relied on toe and tail at the widest parts of the ski, and to boot has been applied the load 19.2 kg. Shape of sidecut is also no secret. 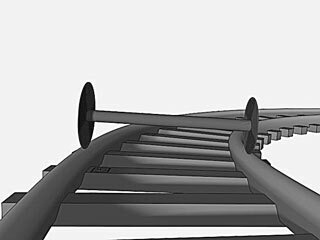 Therefore, we can determine whether in this particular case, ski which bent in a natural way under the force of about 20 kg could lie on a slope on all edge at some angle of leaning. To do this one need calculate the necessary shapes of sidecut for such bent ski for different angles of leaning. 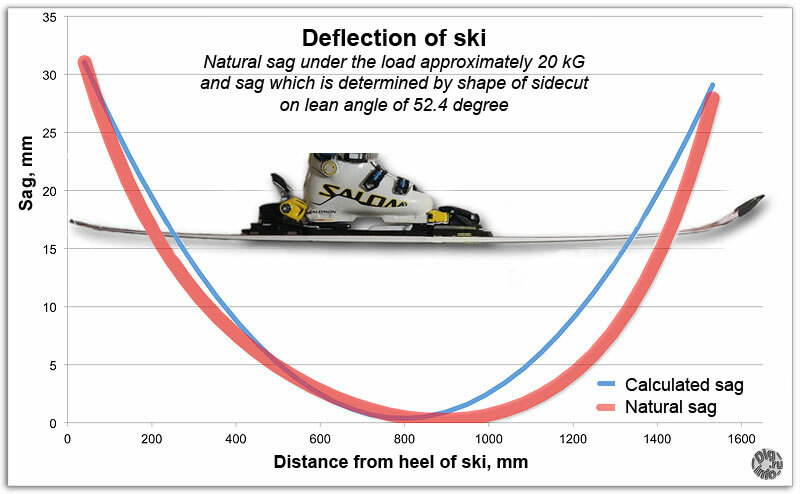 Then select the angle, which lead to the width of the toe and the heel as on “real” ski and compare the calculated and the actual shapes of the sidecut. The shape of calculated deflection is indicated in blue. In fact, it is so differ form natural sag (marked in red), that it is hardly possible to make any conclusion about the possibility of so-bend ski. Most likely it will be accompanied by additional stresses in different directions, which will pull down the ski from the arc. 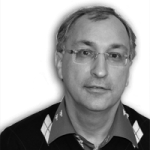 In general, one can make a clear conclusion, but for a tiny special case. For ski bend under load of 20 kg the optimal lean angle for ski Atomic Redster FIS SL is 52 degrees. In this case on hard ice it is impossible to have pure rail-like arc in a turn. Front part of edge will grip but with grindings. 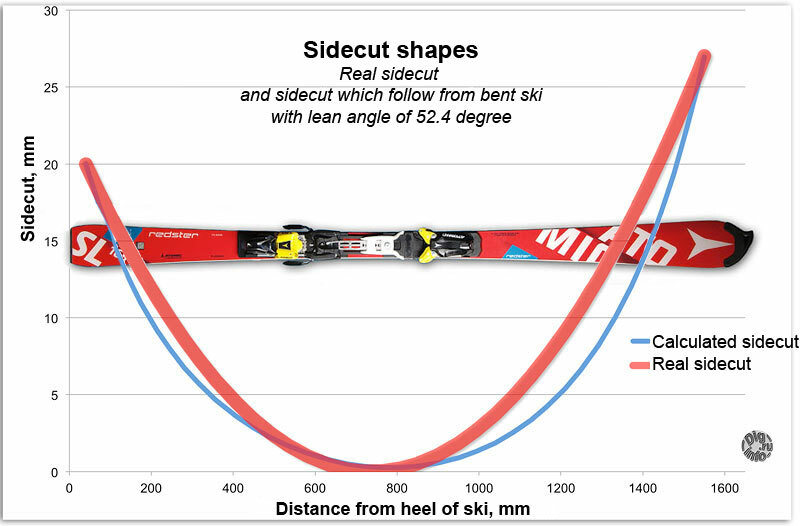 So it can be concluded that Atomic did not consider necessaty of sidecut shape to be in accordance with the deflection of ski. But not from this note, it could be noticed earlier in note “ Atomic Redster FIS SL 15/16, become stiffer “, where can be clearly seen, that the deflection of the new model has changed. While sidecut shape remained the same.